Preston collected their first Championship win since 2011, beating MK Dons who were playing their first home match in the second tier. 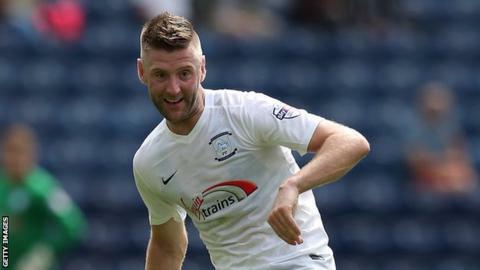 Paul Gallagher proved the difference between the two promoted sides as he finished a fine counter-attack. Carl Baker had the best first-half chance for the Dons, but his header was superbly saved by Jordan Pickford. And North End held out despite seeing substitute Jordan Hugill sent off late on for kicking out at Kyle McFadzean. Milton Keynes, who won their first Championship game 4-1 at Rotherham last week, had begun the stronger, coming close through both Baker and Sam Gallagher, who fired wide. But it was Preston who got the decisive goal when Will Keane and Joe Garner linked up well before the latter played in Gallagher to slot home. North End's Daniel Johnson twice shot wide when well placed either side of Gallagher's effort, before Tom Clarke saw a goalbound effort from a corner disallowed for a push on home goalkeeper David Martin in the build up. In the second half, the Dons were frustrated by a strong defensive display and have still never beaten Preston in nine league meetings between the sides. MK Dons manager Karl Robinson: "A lot of people say we are going to finish 24th in the league and that will drive us forward every single day of the season. "We didn't do enough to win - but we certainly didn't deserve to lose. There was really nothing in the game. "We were much better in the first half and our patience in keeping in the game was outstanding at times." Preston North End boss Simon Grayson: "We are settling into this league and we're not going to get carried away with ourselves. "To take four points from two games - with two clean sheets - I've got to be very pleased. "We were well organised and counter attacked well - I thought we could have had a couple more goals in the first half but the sending off made it more difficult for us at the end. "It's a blatant red card. He (Hugill) didn't need to do it and he's distraught with himself now in the dressing room as he let the rest of the players down." Match ends, MK Dons 0, Preston North End 1. Second Half ends, MK Dons 0, Preston North End 1. Jordan Pickford (Preston North End) is shown the yellow card. Attempt missed. Dale Jennings (MK Dons) right footed shot from outside the box is high and wide to the right. Assisted by Darren Potter. Foul by Dale Jennings (MK Dons). Attempt blocked. Dale Jennings (MK Dons) right footed shot from outside the box is blocked. Corner, MK Dons. Conceded by Daniel Johnson. Attempt blocked. Cristian Benavente (MK Dons) right footed shot from outside the box is blocked. Attempt blocked. Ben Reeves (MK Dons) left footed shot from the centre of the box is blocked. Assisted by Dean Lewington with a cross. Attempt blocked. Dale Jennings (MK Dons) right footed shot from outside the box is blocked. Assisted by Dean Lewington. Corner, MK Dons. Conceded by Paul Huntington. Substitution, Preston North End. Calum Woods replaces Chris Humphrey. Dale Jennings (MK Dons) wins a free kick on the left wing. Attempt blocked. Kyle McFadzean (MK Dons) right footed shot from outside the box is blocked. Assisted by Darren Potter. Jordan Hugill (Preston North End) is shown the red card for violent conduct. Substitution, Preston North End. Jordan Hugill replaces Will Keane. Offside, Preston North End. Paul Huntington tries a through ball, but Will Keane is caught offside. Substitution, MK Dons. Simon Church replaces Carl Baker. Substitution, MK Dons. Dale Jennings replaces Dean Bowditch. Attempt missed. Joe Garner (Preston North End) right footed shot from outside the box misses to the left. Assisted by Will Keane. Will Keane (Preston North End) is shown the yellow card. (MK Dons) wins a free kick in the defensive half. Will Keane (Preston North End).